No one expects to go out to their hunting lease and get injured, but like most any outdoor activity, there is the risk of injury. With firearms involved the injury may be more serious. Every year the International Hunter Education Association (IHEA) compiles a hunting accident incident report. The most prevalent "major factors" cited for these accidents include the following: "Failure to identify target, Victim out of site of the shooter, Firearm fell from insecure rest, Failure to use safety belt, Victim moved into line of fire, Shooter swinging on game, Failure to check beyond target, Careless handling of firearm." IHEA recommends hunters and shooters follow four basic rules of firearms safety, known as the TABK acronym. T - Treat every firearm as it if were loaded. A - Always point the firearm in a safe direction. B - Be sure of your target and what is beyond your target. K - Keep your finger out of the trigger guard and off the trigger until ready to shoot. How Can Hunters Reduce Risks? Hunting accidents of all types happen every year. Most hunting accident victims are responsible hunters who have over 10 years' experience. Although hunting accidents have trended downward as a result of increased hunter education requirements, there are still approximately 1,000 hunting accidents annually. Ten percent are fatal. What can you do to increase safety while hunting? Get proper education. 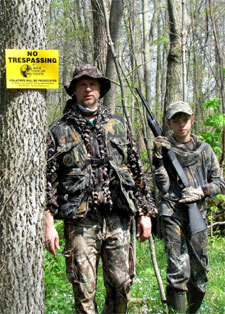 Read, take a hunter safety education course, watch hunter education videos, take an on-line course. A variety of resources exist. Taking a class can be interesting and rewarding, regardless of how long you have been hunting. Practice the skills needed. It's one thing to be book smart and another to put it into play. Some students take a course, but then don't touch a firearm until opening day. Shooting arrows and firearms can be done in a number of safe, supportive places. Follow state guidelines for wearing hunter orange. This universal hunter safety color will dramatically reduce your chance of being mistaken for game. Each state has its own guidelines, which can be viewed on www. IHEA.com under "Hunter Education". Don't take deer stand safety requirements for granted. Follow the instructions on deer stand equipment and check for faulty equipment. In the state of Alabama alone, 2010 had a record number of deer stand accidents. Fourteen accidents were reported and four of these were fatal. Establish a method for locating and communicating with other members of your hunting party. Have a map that outlines where each member will be hunting. Have an emergency plan in place. Avoid consumption of drugs and alcohol. Minimize risk exposure by purchasing hunting lease liability insurance. It's not worth risking your assets and financial security due to an unforeseen accident. "I wouldn't use anyone but the AHLA to insure our hunting lease. They take care of the whole process professionally and timely. That allows me to do what I want to do... hunt! Thanks AHLA!!"